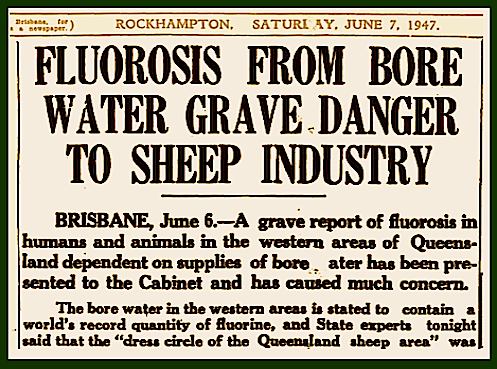 Fluoridation Australia | FLUOROSIS OF SHEEP IN QUEENSLAND +. 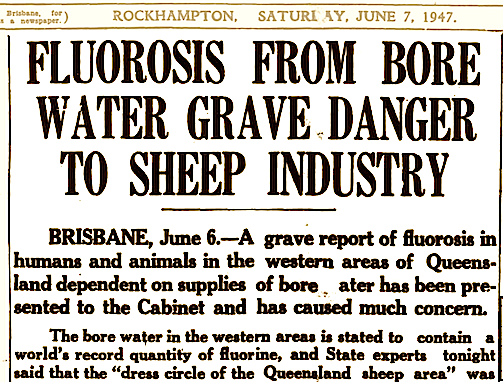 FLUOROSIS OF SHEEP IN QUEENSLAND +. This research has been out of print for many years. and assisted by the University of Queensland. We are not aware of any criticisms of this research. adding fluorides to domestic water supplies. former consultant to the Canadian Dental Association. These three booklets have implications for humans. They are large files and may be a little slow to load. They contain x-ray photos, charts and maps. We apologise that there is some other information on these files. have a hard copy on hand while reading the three books above. 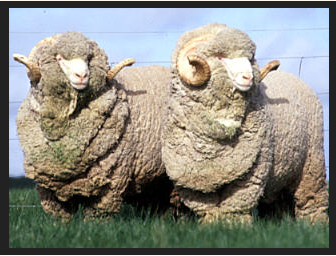 land values, animal husbandry, and wool economics adversely. all viewed exposure of herds to fluoride as a serious and urgent issue. and the application of research findings to animal husbandry. impacts on living tissue, both animal and human. This research has been out of print for many years and was funded by The Queensland Government. It was undertaken without interference from multinational companies, and before artificial water fluoridation was under consideration. As can been seen on the charts, pages 11–16, in the first report, like India, China, Pakistan and much of the middle east, most of the artesian water in Queensland is not suitable for domestic use as it is high in fluorides. Although some of this water is very high in F., sheep do not live as long as humans, who will received a lesser dose under artificial water fluoridation but accumulating for 50 + years, and sheep, unlike humans manufacture Vit.C . Breast milk in humans is also low in F. even if mother is on a high F. diet. (1) There is some accumulation of fluorine in the kidney and thyroid. (1) All groups show a considerable fluorine concentration in bones and teeth as compared with that found in the normal control sheep. Abrasion of Molars and Premolars of Sheep Using Water Containing 5-7 p.p.m. Fluorine and Depastured on Hard Mitchell Grass Country. Note the compensating wear on the upper and lower molars and premolars. The Drinking Water on the Incisor Teeth of Sheep in Endemic Areas. unsuitable water during its first year of life. Centre, Teeth from a 6-tooth sheep on unsuitable water from an early age. unsuitable water during its growing period. (6) Teeth – Apart from the usual lesions associated with fluorosis, there are indications the fluorine in the drinking water delays the eruption of the incisors and produces badly deformed mouths. The elongation of the incisors and some abnormalities may be partly due to the type of feeding and mineral imbalance. There were, however, cases of delayed eruption and deformed mouths in groups 6 and 7, where the animals were on a balanced diet. (4.) Pregnant ewes drinking water containing up to 10 p.p.m. F. do not transmit appreciable quantities of fluorine either to the foetus or to the lamb through the milk after birth. However, although this procedure is safe with regard to the lamb, field evidence does suggest lower lambing figures in such ewes. In addition, water containing 10 p.p.m. is certainly harmful to young breeding ewes. Breast milk in humans is also low in F. even if the mother is on a high F. diet. Nature protects its young from F. especially at the beginning of life when the blood brain barrier is not yet well formed. who gave their lives to this research. Vitamin C or L-ascorbate is an essential nutrient for a large number of higher primate species, a small number of other mammalian species (notably guinea pigs and bats), a few species of birds, and some fish. ‘C’ TO DETOXIFY THE F.
Livestock production in Australia and New Zealand relies on both surface water and groundwater supplies. Water quality in streams and dams (surface waters) is influenced by catchment geology, topography, soil type and climate. 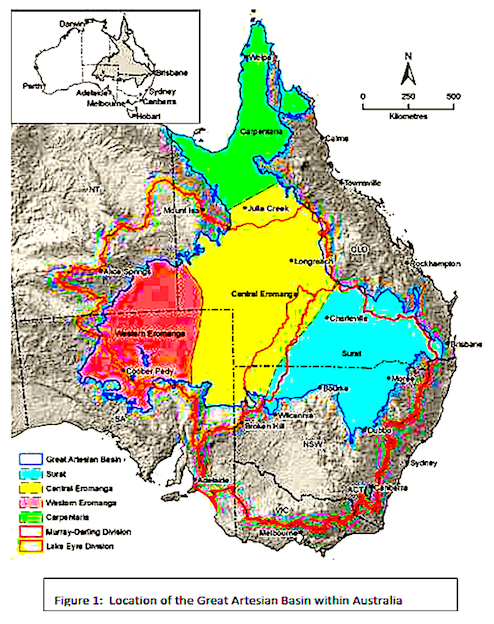 Groundwater, which is used as a source of drinking water for livestock over a large area of Australia (and in parts of New Zealand), may contain large quantities of dissolved salts, depending on the soil and parent rock of the surrounding area and many other factors including rainfall, evaporation, vegetation and topography. The quality of both groundwaters and surface waters may be affected by catchment land use practices, including agriculture, mining and other industries, with the potential for increased concentrations of salt, nutrients and other contaminants, such as pesticide residues and heavy metals. Daily water intake varies widely among different forms of livestock and is also influenced by factors such as climate and the type of feed being consumed. Average and peak daily water requirements for a range of livestock are given in table 9.3.1. Fluoride concentrations greater than 2 mg/L in drinking water for livestock may be hazardous to animal health. If livestock feed contains fluoride, the trigger value should be reduced to 1.0 mg/L. Unpolluted surface waters generally contain low concentrations of fluoride but concentrations in groundwater may be higher in some areas. For example, groundwater at Carnarvon, Western Australia, contains fluoride at concentrations up to 5 mg/L (Hart 1974). Groundwater fluoride concentrations >2 mg/L have been reported at several locations in Queensland, mainly in the Great Artesian Basin, with a few cases showing concentrations >10 mg/L fluoride (Gill 1986). 1978, CPHA 1979). In Queensland, fluoride in drinking water for livestock at concentrations greater than 2 mg/L has been observed to affect the teeth of young animals (VIRASC 1980). The diet may be another source of excessive ingestion of fluoride if the vegetation is contaminated by aerial deposition in industrial areas (NAS 1971), but no toxic effects were reported from dietary concentrations of 30–50 mg/kg for cattle, 70–100 mg/kg for sheep and pigs and 150–400 mg/kg for poultry. Van Hensburn and de Vos (1966) showed that levels of fluoride >5 mg/L in drinking water adversely affected breeding efficiency in cattle. Moreover, Hibbs and Thilsted (1983) reported erosion of teeth at concentrations of 3.3 mg/L. Experiments with laying hens showed a significant reduction in egg production for hens receiving 6 and 20 mg/L sodium fluoride (2.7 and 9 mg/L fluoride) in their drinking water but that successful production could continue with concentrations up to 14 mg/L sodium fluoride (6.3 mg/L fluoride) (Coetzee et al. 1997). The risk of fluorosis in either sheep or cattle may be avoided if sufficient water of low fluoride concentration (e.g. surface water) is available and paddocks arranged so that young stock have access only to fluoride-free water for the first three years of life. Where only limited quantities of low-fluoride water are available, the damage from fluorosis will be minimal if young stock are exposed to fluoride-enriched water for no more than three months at a time and then kept for at least three months on low-fluoride water. Control measures are less important in good seasons when stock receive the bulk of their fluid requirements from pasture. 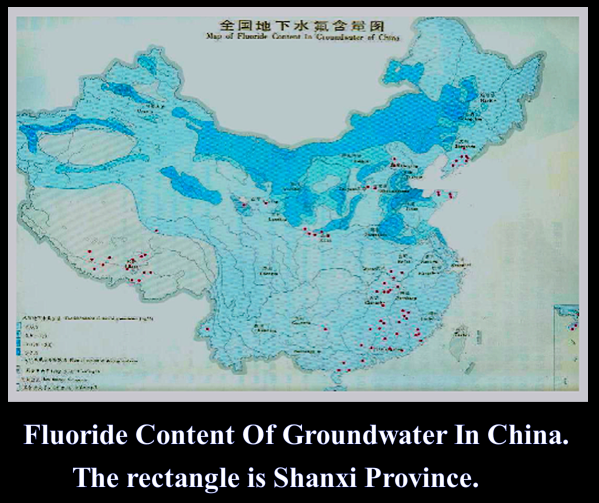 The fluoride concentration in water is rapidly increased by evaporation. This is particularly evident in flowing bores where the water is reticulated through shallow bore drains. As a temporary measure while paddocks are being arranged so that young stock may be kept on low-fluoride water, it is important that the young stock should be watered as near to the bore head as possible. 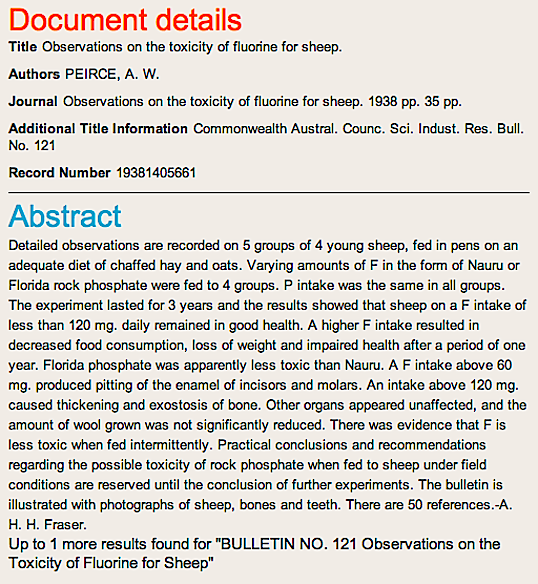 THE BONE FLUORIDE OF EWES AND LAMBS IN N.S.W. Studies on fluorosis of sheep. II. The toxicity of water-borne fluoride for mature grazing sheep. The bone fluoride of ewes and lambs in NSW. in their livers, which gives them some protection from fluoride damage. BUT HUMAN LIVERS DO NOT HAVE THIS FUNCTION. than most animals even on lower doses. Is NOT Used To Artificially Fluoridate Water. Sodium Fluorosilicate – S6 and Fluorosilicic Acid – S7. found in nature as fluorine. There are many kinds of fluorides. not as harmful as fluorosilicic acid. scale. More toxic than lead, slightly less toxic than arsenic. These are also present in Fluorosilicic Acid. get a better deal than the human sheep! rather than a doctor – on the matter of fluoridation.